Once the home of Waltons music store and now an elegant three star hotel, its founding owner was bodyguard to the famous historical figure Michael Collins. Waltons Hotel provides a warm welcome and great accommodation. Located in North Frederick Street Dublin it is ideal for the guest who wants to shop, explore the tourist attractions or attend business meetings. The staff in Walton’s Hotel are friendly and highly trained and will ensure that the guest enjoys a memorable visit. The en suit rooms are gracefully finished and contain all the necessary facilities for the modern guest. Facilities include, direct dial telephone, TV, tea and coffee making facilities, hairdryer, iron available from reception, wake-up calls, babysitting services available on request and the service of an elevator. There is a meeting room and also a private car park is available for a small extra fee. Ideally located in the heart of Dublin City and only a short walk from O'Connell Street, one of Europe’s widest streets it is the perfect base to enjoy Dublin. Guests can shop till they drop in Grafton Street with a wide range of shops and be entertained by talented buskers. Or stroll to Temple Bar and enjoy the quaint little shops, cobblestone streets, a unique bohemian atmosphere and the hottest night life in town. For a historical view of Dublin check out Trinity College with its Book of Kells and The Old Library, The Natural History Museum, The National Gallery, Dail Eireann and Dublin Castle. For theatre lovers the main theatres are close at hand. The hotel overlooks Findlaters 19th Century church and the 20th Century Rotunda Hospital. 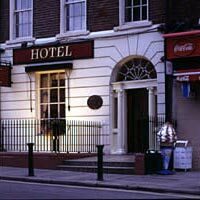 Dublin Hotels - 1 Walkers Cottages, Ranelagh, Dublin 6, Ireland.